With just under six weeks to go until this year’s conference our team is working towards delivering another program of engaging workshops and inspirational speakers. The Bottom Line conference will look at big challenges in the workplace, how real-world organizations have addressed them and what tools you need now for the big changes ahead. Find out how to register. CMHA National has unveiled the closing project of our 100th anniversary year - a historical video that tells the story of our first century. The 2-minute video shows how the association came to be and the role we have played at the forefront of mental health in Canada. Watch the video. 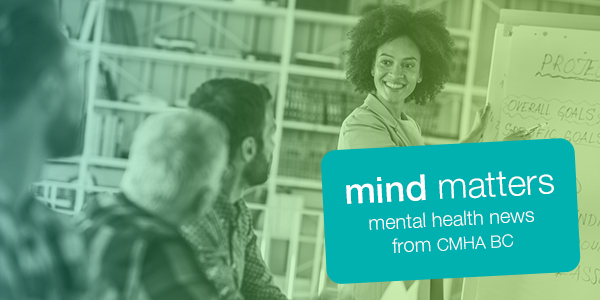 The Mental Health Commission of Canada has released a new toolkit which will help employers create an inclusive work environment that includes and supports individuals living with mental illness. The toolkit outlines the steps and strategies organizations can implement. Download the toolkit. The Centre for Suicide Prevention has produced a new resource toolkit providing information on: the prevalence of suicide in transgender people, risk factors and protective factors, warning signs, and how we can work to prevent suicide in the transgender population. Download the new toolkit. Stand Up For Mental Health is an award-winning program that teaches folks with mental health issues how to perform stand up comedy as a way of building confidence and fighting public stigma. The SMH Society is currently recruiting comics for their next Vancouver classes beginning in July 2019.Find out more. Gain practical expertise to help employers improve psychological health and safety or implement the National Standard of Canada for Psychological Health and Safety in the Workplace in their workplaces. Register by February 8. Suitable for employees and general audiences, this workshop is designed to help build comfort in talking about mental health and mental illness and learn how to respond in a supportive way to co-workers who may be experiencing a mental illness. Register by February 22. Summit 2019, Building Connection At All Levels: A Socio-Ecological Approach to Well-being on Campus, will feature an array of inspiring speakers, engaging co-learning and collaboration, and immersive workshops aimed to inspire innovation and action on campus and beyond campus. Find out more. Internationally acclaimed health researchers, and founders of The Equality Trust, Richard Wilkinson and Kate Pickett will attend this event to launch their newest book which considers the impact of income inequality on mental health, substance use and stress. Find out more. CMHA Vernon & District Branch has partnered with local organizations, physicians and community leaders in Vernon, Armstrong and Lumby to run a series of community forums about substance use, mental health promotion and suicide prevention..The Armstrong forum will be held on February 12, and the Lumby forum will take place on March 12. Find out more about these events. We are seeking a Chief Executive Officer (CEO) to provide overall leadership for CMHA BC, working with the Chair and the Board of Directors, along with a staff of senior leaders to ensure the Division achieves its strategic objectives and furthers the Division’s mission and values. Learn more about the job criteria. As part of our Employment Services team, the Job Developer works with participants whose mental illnesses and/or addictions provide substantial barriers to employment. The person in this role supports and assists participants with implementing their individualized Return to Work Action Plan, and builds relationships with potential employers. Learn more about the position. With your help, we can make a difference. Your donation provides hope and help to those affected by mental illness. MIND MATTERS is completely free and your e-mail address is not shared with any third party. If you would like to know more about our efforts to ensure your privacy is maintained, please contact us. Mind Matters wouldn't be possible without support from donors like you. If your BC agency has news or events you would like to promote in Mind Matters, please e-mail a short paragraph to mindmatters@cmha.bc.ca. If you no longer wish to receive Mind Matters, you may unsubscribe. This newsletter contains information collected from a wide variety of sources, individuals and organizations which we consider reliable. However the content of the news delivered as well as referred to does not necessarily represent the views of CMHA BC. Under no circumstances shall CMHA, its employees, directors, volunteers, or the authors of information provided in this newsletter, be liable for damages, losses, demands, or claims.